Curious kids unearth the barrels that helped revive the dead of the first film, which proves the second time's an undead charm. 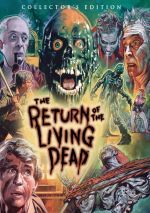 Back in 1985, Return of the Living Dead offered a semi-sequel to 1968’s classic Night of the Living Dead and it turned into a decent cult hit. 1988 brought another chapter in this saga, as the 1985 film spawned a “true sequel” called Return of the Living Dead Part II. As seen in the first movie, “Trioxin gas” can bring the dead back to life, and the military tries to keep its effects under wraps. However, a drum filled with the substance falls off a transport and lands in a river. When young Jesse Wilson (Michael Kenworthy) flees bullies, they find the barrel and open it. This releases the poison, an action that resurrects the dead and also transforms the living into zombies. Perplexing Choice Number One: Dead II brings back a few actors from the first film, as stars James Karen and Thom Mathews reappear here. However, both of their Dead characters died and were clearly eliminated, so they play new roles. This seems like a bizarre decision. Anyone who didn’t see the first film won’t care that these actors appear in the sequel, and those who did view Dead will just feel confused. As I write this, I have yet to screen the Blu-ray’s extras, so maybe the filmmakers will give a good explanation for the return of Karen and Matthews. On the surface, though, it just seems like an odd, unproductive gimmick. Perplexing Choice Number Two: the focus on young Jesse. Even with its comedy, the first Dead went for a fairly hard “R”, whereas Dead II comes across as a film that wants to get the kiddie audience. This means it largely feels like it strives for a “PG-13”, as we don’t see much to merit the “R”. Dead II includes just enough profanity and violence for the stronger rating, but the end result feels so tame that it seems unlikely to satisfy the gore-lovers in the audience. As such, Part II winds up as a weird compromise. It’s too graphic for a young teen crowd, but it’s too limp for an older group that desires something more extreme. I do understand the desire to play it both ways, as we saw a lot of that in the late 1980s. Horror went pretty mainstream in that decade, and younger audiences embraced characters like Freddie Krueger. Eager for bigger profits, studios felt enticed to tone down the action to get the “PG-13” crowd. This didn’t work, though, as the “safer” content alienated viewers. I suspect this occurred with Dead II, as it loses so much of what made the first film entertaining. Whereas the 1985 flick offered a glib, wacky affair, it still packed a good sense of gore to satisfy the standard horror fans. Dead II goes soft and emphasizes comedy and silliness above all else. While the first film didn’t come across as all that scary, the sequel barely attempts any sense of horror, and this makes it tepid and inane. On the positive side, the movie’s makeup and effects work reasonably well. Though I don’t think they excel, they hold up nicely for a low-budget effort from 30 years ago. Otherwise, Dead II sputters. I liked its predecessor but the sequel lacks its own sense of flair and thrills. Return of the Living Dead Part II appears in an aspect ratio of approximately 1.85:1 on this Blu-ray Disc. Expect a decent but dated transfer. Sharpness looked passable. While the movie never seemed terribly soft, it didn’t come across as particularly detailed or accurate, either. This left us with reasonable delineation but nothing more. I discerned no problems related to jagged edges or moiré effects, and edge haloes created no distractions. A smattering of small specks cropped up during the movie but nothing major interfered. Colors tended toward sense of blues and oranges that might look at home among modern film. The hues tended to seem a bit thick and muddy, a factor that occasionally impacted late 80s movies. Black levels appeared reasonably dark – if a little too thick at times - while shadow detail presented acceptable delineation. The image remained perfectly watchable but not much more than that. Though not great, DTS—HD MA stereo soundtrack of Dead II held up fine given its age. The soundfield boasted pretty good stereo presence for the film’s score, and effects broadened to the sides in a positive manner. These elements fared best in the handful of action-oriented scenes, as those allowed the material to move across the speakers well. Environmental information also used the channels in a satisfying way, as a few scenes brought us well-depicted breadth. Audio quality showed its age but remained more than acceptable. Dialogue occasionally sounded a little reedy, but the lines remained intelligible and reasonably natural. Music showed decent range and dimensionality. Effects seemed similarly positive, though a little distortion popped up at times. Nothing here excelled, but the soundtrack seemed acceptable for its age. Packed with extras, the Blu-ray includes three separate audio commentaries, the first of which involves writer/director Ken Wiederhorn and actor Thor Van Lingen. Both recorded separate running tracks that got edited together for this piece. Wiederhorn touches on how he came onto the project as well as various filmmaking topics such as cast/performances, sets and locations, effects and various challenges. Van Lingen sticks mainly with his own experiences as a child actor on the shoot. At times, Van Lingen brings out some good thoughts about his time on the film, but he often just describes what we see, albeit in a mildly wry manner. Van Lingen fills more of the commentary’s span than I’d like, as he doesn’t have a lot to say about the production. Wiederhorn fares much better, especially because he doesn’t hesitate to discuss negative experiences during the shoot. Unfortunately, we don’t get as much Wiederhorn as I’d like. His aspects of the commentary fare the best but Wiederhorn fades to the background too often. For the second commentary, we hear from actor Suzanne Snyder. Along with supplements producer Michael Perez, we hear about cast and performances as well as sets/locations, music and other domains. Occasionally we get some decent nuggets here, but not many of these arrive. Much of the chat seems pretty banal, as neither Snyder nor Perez dig into the film with a lot of depth. Though it’s not a bad track, it’s pretty mediocre. Lastly, we find a commentary with author Gary Smart and filmmaker Christopher Griffiths. Both sit together to bring a running, screen-specific discussion of the film, the franchise, and the genre. Smart and Griffiths offered an amiable chat alongside the first film, and they continue that trend here. Actually, this commentary seems more informative than its predecessor, as it delves into various facts more actively. It turns into a useful little discussion. With that we head to a slew of video programs, and these begin with Back to the Dead. It goes for 25 minutes, one second and involves notes from special makeup effects creator Kenny Myers and makeup effects artists Andy Schoneberg and Mike Smithson. As one can infer from the participants, “Dead” looks at the film’s makeup effects. It turns into a tight, informative overview. After this we locate The Laughing Dead, a 19-minute, 22-second reel with Wiederhorn. He discusses how he got into filmmaking as well as aspects of his career and elements related to Dead II. Inevitably, some of this material repeats from his commentary, but Wiederhorn offers a pretty good chat nonetheless. Music comes to the fore with Undead Melodies. It fills 12 minutes, 48 seconds with notes from composer J. Peter Robinson. As expected, Robinson covers his work in films, with an emphasis on Dead II. He brings us an enjoyable conversation. An Interview with Troy Fromin lasts a mere two minutes, 10 seconds. Fromin plays a small role as an Army truck driver and he gives us his perspective. It’s a brief clip that doesn’t tell us much, though given Fromin’s limited participation in the film, it’s probably as long as it needs to be. We find a general overview via They Won’t Stay Dead, a 29-minute, 45-second piece. It involves Myers, Snyder, marketing executive Paul Sammon, actors James Karen, Michael Kenworthy, Allan Trautman, Brian Peck, Suzanne Snyder and Thom Mathews, and original film participants Linnea Quigley, Beverly Randolph, Don Calfa, special makeup effects creator Tony Gardner, co-producer Graham Henderson, and production designer William Stout. Most shows like this emphasize positivity, but not “Dead”, as it brings out all sorts of criticism, mainly from those who worked on the first film but not the second. They don’t show sour grapes, though – they seem genuinely displeased by the sequel and they make valid points. “Dead” eventually shifts into a more traditional view but its unusual perspective and its honesty make it refreshing. It delivers a solid program with a surprising amount of criticism about the end product. Next comes a Vintage Featurette that runs five minutes, 35 seconds and features Wiederhorn, Mathews, Karen, and Myers. It looks at a mix of elements on the set and feels silly, though some of the behind the scenes footage offers value. From the same era, we find two minutes, 36 seconds of Vintage Interviews< with Wiederhorn, Karen, Mathews, and Myers. Much of the material already appears in the “Vintage Featurette”, and the smattering of added notes lack a lot of merit. Under Behind the Scenes Footage, we locate four minutes, 14 seconds of material. These clips show us elements related to zombies, and they become moderately interesting. In addition to a teaser trailer and a theatrical trailer, we find four TV spots. We end with two Still Galleries: “Special Effects Makeup” (70 images) and “Posters & Lobby Cards” (20). Both add value. 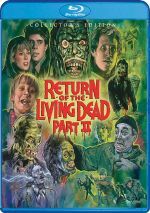 While I liked its predecessor, Return of the Living Dead Part II becomes a limp sequel. It lacks personality or the sense of fun it needs. The Blu-ray brings adequate picture and audio along with a long roster of supplements. Although this doesn’t become a truly bad horror comedy, it doesn’t turn into anything memorable.